This design source contains 101 illuminated letters hand painted by the author with the black and white version on an adjacent page which can be photocopied or scanned. There are more examples of letters used at the beginnings of words than of the least common letters. A comprehensive design source book of all types of Celtic illuminated letters by leading exponent of Celtic art, Courtney Davis. 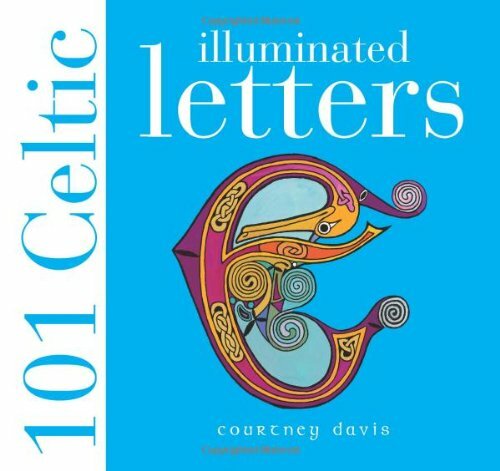 The 101 illuminated letters reflect the history of Celtic design from the earliest examples to Courtney Davis's own celebrated modern interpretations. Many of the illuminated letters are from, or inspired by, the famous Celtic manuscripts such as the Lindisfarne Gospels and the Book of Kells. The 101 designs are all hand painted by Courtney Davis and printed in full colour. Each is accompanied by a black and white version of the same image on the adjacent page - perfect for scanning or photocopying for use on readers' personal art, design or craft project. The book contains two complete alphabets and the remaining letters are structured so that those most commonly used at the beginning of words are represented with many more examples than the least common letters. The introduction gives a brief history of the Celts and an explanation of the birth and development of their artistic style with particular relation to illuminated letter designs.